Take your content marketing efforts to the next level. Use Shareaholic. If you are an entrepreneur like I am and are honest with yourself, you will admit that making a big splash with your content is nowhere near as easy as it used to be. A few years ago you could write top 10 lists and other types of shallow content (often referred to as link bait) that would bring a flood of traffic to your site. Readers are much more skeptical and tired of link bait, top 10 lists and other types of content that really only exist to try to trick you into visiting yet another affiliate marketing site. It’s just a cheap and all-too-easy way to drive traffic. Even if it miraculously works, it most likely will not result in traffic that converts into loyal customers who respect your brand. If your marketing team is telling you this is the way to go, you desperately need a new staff. Given many of the recent updates to Google’s algorithm, you must make sure the content you produce is actually valuable to users. Specifically, the keywords you target and use should relate to your area of expertise and provide answers that users may not be able to get anywhere else. That simply means that your content should be unique, well researched and provide clear takeaways for readers. If you aren’t diligent about this, you could find yourself penalized by Google, and this is exceptionally hard to recover from, whether it is an algorithmic or a manual penalty. The sheer volume of people churning out content, even in very niche areas, is staggering. Regardless of whether it is high quality content or not, the volume provides so much noise that it is a challenge to get even a well-crafted message out to your target audience. Sadly, in this ocean of content, we are all drowning, trying our best to stay afloat. T – Top 10 lists have got to go. R – Rehashing/rewording old articles has to stop. E – Easy articles to write are probably a waste of time. A – Attribute clearly, do not plagiarize. D – Dirty jokes and tricks almost always backfire. I – Infographics without research are just graphics. N – News, while nice filler, ages very quickly. G – Gimmicks are more transparent than you think. S – Stick to what you know, especially if you are an expert. W – Write content yourself, don’t outsource it to others. I – Interview other experts in your field and give interviews. M – Motivate users by explaining what you can do for THEM. All of this gets down to the heart of what is important in getting your message out in the middle of this ocean. Understand the problems that your new product or service can solve. Then address the very specific people that stand to benefit the most from your offering. This isn’t a cursory review. This is actually conducting surveys and other research to measure the problem and the potential impact of your solution. Write comprehensive how-to and self-help guides. One of the best ways to get more of your target users to engage is to help them solve a very real problem they may have that relates to your product or service. This approach establishes you as an authority and greatly improves your chances of getting your brand recognized via word of mouth. Do what you can within your budget to leverage multimedia. Now, this does not mean whip out your iPhone and create a quick Vine that you hope will go viral. This means putting together thoughtful and professional videos, images, and content that all work toward the goal of providing answers to your readers and engaging them with your brand through various mediums. At the end of the day, the most important point to remember is that as an entrepreneur you have to seek out ways to turn your passion into something of tangible value for your readers and your customers. 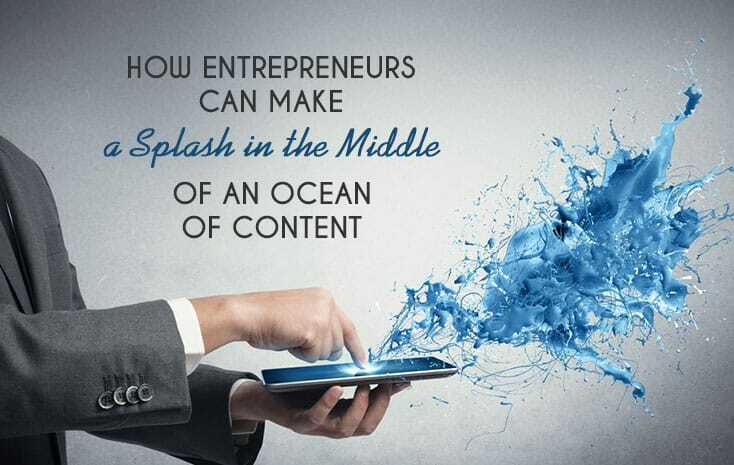 The quicker you find ways to do that, the quicker you will find yourself making a meaningful splash in the ocean of content inundating our lives. About the author: Ken Myers is a father, husband, and entrepreneur. He has combined his passion for helping others with starting businesses that make a difference. Learn more about him by visiting @KenneyMyers on Twitter. At Shareaholic, our blog is a portal for you, our readers. Therefore, we happily invite you to write for us too. Want to work at a startup? Join the family in Boston.